Posted on Sun, Jan 22, 2012 : 2:01 p.m. The Longworth buildings in downtown Chelsea were given another reprieve from the wrecking ball when the Chelsea Downtown Development Authority unanimously approved a series of resolutions Thursday, which include one to sell the buildings on Jackson Street for $1. However, there are several conditions attached to the sale. First, the purchaser must return the property to the city’s tax rolls. 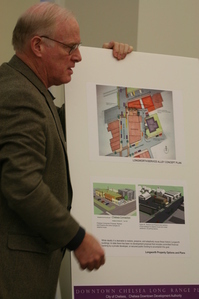 Pete Flintoft shows a concept plan for the Longworth building and the Jackson Street area in Chelsea. but where is the next level of passion?,” he asked a vocal and enthusiastic group of residents who attended the meeting and want to save the buildings. Despite their efforts, Preservation Chelsea and The Chelsea Connection haven’t been able to find private investors for the Longworth property, which not only needs a lot of work but also considerable contaminant removal. Among them, the city has secured a Federal grant for up to $200,000 to have the asbestos removed from the buildings, but DDA is seeking private investors to buy the buildings and fund a project there. In December 2008, the DDA bought the Longworth property and its three buildings for $400,000, and in June 2009, it voted to demolish the Daniels Showroom, which faces Main Street, and the nearby livery building while leaving the Mack Building, which is between the two. Preservation Chelsea, a citizen’s group, has been working to save the buildings at 110 Jackson St., which include the old livery, which dates back to 1905. Also located there are the Mack Building, which was built in 1901, and The Daniels Showroom, which once was home to an auto dealership. In fact, the group got 700 signatures on a petition that was presented to the DDA to save the livery. In addition, the preservationists to have downtown Chelsea included on the National Register of Historic Places. 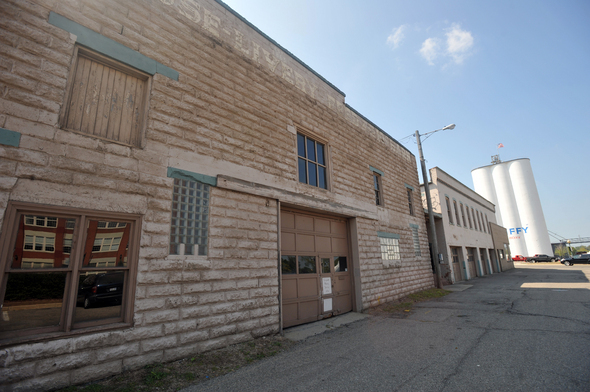 In January 2009, AR Brouwer, a Dexter developer, put together a $1.5 to $1.75 million cost estimate to renovate the buildings, then in June 2009, the DDA voted to demolish the show room and the livery building while leaving the Mack building. In August 2009, the DDA delayed the demolition of the buildings for 60 days, and in January 2010, a request for proposal was issued. 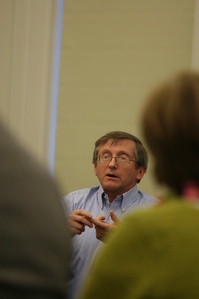 The city received one response from the Chelsea Connection, which they said was not economically viable. Again, in April 2010, the DDA extended the request for proposal deadline an additional 90 days in the hopes that a private developer would show interest. Numerous meetings have been held to discuss a downtown development plan, which have included concept ideas for the Jackson Street corridor, which includes the Longworth properties. Tom Girard, a longtime Chelsea resident, who is in the design and construction business, said that in three years since the DDA purchased the buildings, they have experienced three years of decay. He said he was concerned that the “project goals” for the area have not been “well defined,” and he offered to work with the citizens groups trying to save the building and the DDA to write a request for proposal for its sale. Janet Krieger, president of the Michigan Historic Preservation Network, also spoke to the DDA, and said her group has been successful in bringing investors together for projects similar to the Longworth property and she stressed the importance of historic preservation and rehabilitation of historic buildings. In addition to the discussion of the Longworth property, the DDA approved a traffic study for the Jackson Street corridor, which includes the Farmers Supply store and The Depot. Originally, the DDA proposed changing two-way traffic to eastbound traffic only and reducing the road to one lane. Greg Raye of Chelsea Farmers Supply called it “a terrible idea” in vehemently opposing the change that said would hurt his business and would encourage cars to drive faster down the narrow street that parallel’s the railroad tracks. *The removal of the auto dealership addition to the Mack Building while restoring the western wall, windows and entry to the building to its “historic character as nearly as possible, and the open space be redeveloped as landscaped public space,” based on concept drawings. *Sidewalk and landscaping along the north side of the Longworth property that connect Main Street and The Depot, plus fencing, site improvements and landscaping along the railroad. *The removal of the livery building with the open space to be redeveloped or the livery building to be remodeled and redeveloped. Sun, Jan 22, 2012 : 8:43 p.m. I hope to see someone or some people step up and take this on. I think we all love the historical beauty of Chelsea.